To successfully build and retain a reliable client base in the HVAC industry, you must stay organized and become efficient with your daily business practices. Your bottom line will surely suffer if your field techs show up late to appointments and you fail to effectively communicate important client information amongst team members. Word of mouth can harm a small business that relies on the local community to stay afloat. Owning your reputation and taking steps to improve it is vitally important. Luckily, some resources provide tremendous help. 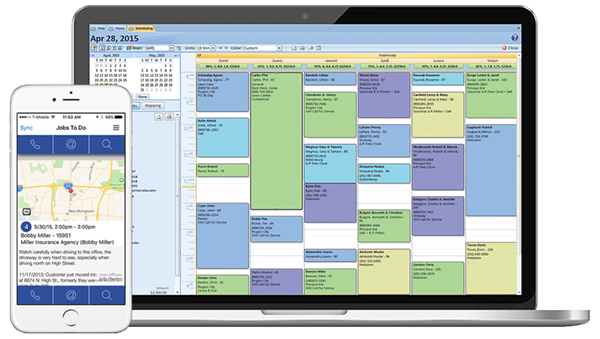 HVAC software gives you the tools you need to streamline your scheduling process, manage your customer database, handle billing and invoices, improve team communication, and so much more. Read all of the software features details below. For more information on our solutions, visit our HVAC software page. Double booking your employees in the field constitutes a real problem for small businesses, forcing them to manually handle a large number of jobs and keep up on last minute rescheduling. This time sink can have a huge impact on your day to day efficiency and will likely lose you clients if issues arise too often. With HVAC software, scheduling becomes a breeze and requires just a fraction of the time needed to manually do the work. Eliminate double booking by easily viewing every field technician’s schedule and update your entire team immediately via their mobile devices when changes occur. Use HVAC software to cut down on time wasted on the road. Working out the most logical route for every employee in the field, especially when you take into account rescheduling and cancellations, can make for a near impossible task when managed by hand. With HVAC software, you can easily dispatch your workers without rifling through filing cabinets and making a multitude of phone calls. If a job gets canceled you can reroute your employees and notify them of the new changes with incredible ease. Easily set up recurring appointments and update work order information to remember effective routes. Don’t start from scratch each time! One of the most valuable benefits HVAC software provides? The ability to track work orders and monitor the time employees spend on jobs. HVAC software frees you from much of the hassle of keeping tabs on your workers in the field. Instead, you can spend your time making the critical high-level decisions that will put you ahead of your competition. Equipment tracking lets you coordinate and monitor your valuable assets, so you can rest easy knowing your tools are safe and in the right hands at the right time. HVAC Software lets you keep up-to-the-minute tabs on job notes so that your employees remain fully informed. Field technicians become empowered to make decisions when they know they have the most complete and up to date information at all times. Forget about the need to rely on antiquated software, or worse, to keep track of filing cabinets containing dozens and dozens of folders containing customer records. Smart Service HVAC software integrates seamlessly with Quickbooks so that you can transfer your customer data and scale up your business operations as you grow. Instead of turning in a stack of crumpled invoices at the end of the day, your field techs can handle invoicing digitally while on the job. This saves your workers significant time and can even free them up to complete additional jobs. You can even manage your payroll with Smart Service HVAC software. With the iFleet mobile app, communicating with your team becomes easy. iFleet, which works hand-in-hand with Smart Service HVAC software, represents the finest field service app on the market. Your techs will enjoy instant access to client information, service histories, company forms, and more with their mobile devices. Request a demo today to see if Smart Service HVAC Software is right for your business.